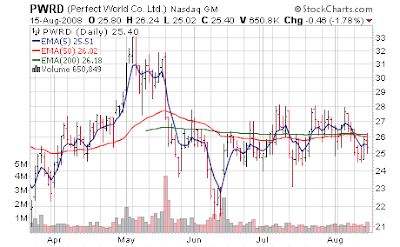 Should be an interesting reaction to Perfect World (PWRD) earnings today - last time around they beat estimates by 3 cents, but gave very light guidance [May 19: Perfect World - Good Earnings, Light Guidance; Buying the Dip] that they quickly upped within a month when the stock was hammered [Jun 13: Perfect World up 13% in Early Trading on Raised Guidance]. This time around - in line earnings and in line to slightly upward guidance - with such a depressed valuation; the stock is trading nearly 25% lower than where it was ahead of last quarter's earnings report - it will be interesting to see how the market handles the stock. As they had warned the earthquake and aftermath did effect results, but still tremendous year over year growth and solid sequential growth. Total revenues were RMB334.4 million (USD48.8 million) in 2Q08, an increase of 10.3%, or RMB31.3 million, from RMB303.2 million in 1Q08 and an increase of 157.8%, or RMB204.7 million, from RMB129.7 million in 2Q07. The sequential increase in online game operation revenues was primarily attributable to a full quarter of revenue contribution from Chi Bi, the successful launch of expansion packs for some of the Company's existing MMORPGs and the positive market response from recent marketing campaigns. In addition, as the user base of the Company's games keep expanding while the accumulated number of inactive accounts has also continued to grow, in 2Q08 we began to enforce our rights to close a player's game account that has been inactive for 360 consecutive days. Revenues recognized from the inactive accounts were approximately RMB8.4 million in 2Q08. The Company will continue to implement this policy and recognize revenues from inactive accounts on a quarterly basis. The ACU (Average Concurrent Users) was approximately 619,000 in 2Q08, as compared to 660,000 in 1Q08 and 446,000 in 2Q07. The APC for games under the item-based revenue model was approximately 1,530,000 in 2Q08, as compared to 1,701,000 in 1Q08 and 1,036,000 in 2Q07. The ARPU for games under the item-based revenue model was RMB188 in 2Q08, an increase of 24.9%, or RMB37, from RMB151 in 1Q08 and an increase of 92.2%, or RMB90, from RMB98 in 2Q07. While ACU and APC decreased by 6.2% and 10.1% from 1Q08, which was mainly due to the Sichuan earthquake, the following three day suspension of game service, and the continued impact after the earthquake for a certain period of time, the Company still managed to increase ARPU by 24.9% through a series of successful promotions and the launch of new expansion packs for "Zhu Xian," "Chi Bi," and "Perfect World II." Average paying customers (APC) for games under item based revenue model was RMB188, an increase of 24.9% from Q1 2008 and 92.2% from Q2 2007. Gross profit was RMB293.3 million (USD42.8 million) in 2Q08, an increase of 10.4%, or RMB27.7 million, from RMB265.6 million in 1Q08, and an increase of 182.2%, or RMB189.3 million, from RMB103.9 million in 2Q07. Gross margin was 87.7% in 2Q08, as compared to 87.6 % in 1Q08 and 80.1% in 2Q07. Operating profit was RMB166.0 million (USD24.2 million) in 2Q08, an increase of 2.7%, or RMB4.4 million, from RMB161.6 million in 1Q08, and an increase of 204.7%, or RMB111.5 million, from RMB54.5 million in 2Q07. Net income was RMB164.5 million (USD24.0 million) in 2Q08, an increase of 3.9%, or RMB6.1 million, from RMB158.4 million in 1Q08, and an increase of 214.1%, or RMB112.1 million, from RMB52.4 million in 2Q07. Basic and diluted earnings per ADS were RMB2.93 (USD0.43) and RMB2.76 (USD0.40), respectively, in 2Q08, as compared to basic and diluted earnings per ADS of RMB2.83 and RMB2.67, respectively, in 1Q08, and basic and diluted earnings per ADS of RMB1.67 and RMB1.06, respectively, in 2Q07. The Company launched unlimited closed beta testing for "Pocketpet Journey West" which allows users to buy in-game items on July 17, 2008. The Company launched "The Return of the Storm" expansion pack for "Legend of Martial Arts" on July 24, 2008, the "Hot Dance Party 2.0" expansion pack on August 5, 2008, the "Mazy Treasure Island" expansion pack for "Perfect World" on August 6, 2008, and the "Asura Battlefield" expansion pack for "Perfect World II" on August 13, 2008. The Company will launch a localized version of "Perfect World II" through its wholly owned U.S. subsidiary, Perfect World Entertainment Inc., in North America in the name of "Perfect World International." The closed beta testing has been scheduled on August 19, 2008, while the game's official website has already been successfully launched. The Company expects to launch open beta testing for "Pocketpet Journey West" at the end of third quarter or early fourth quarter of 2008. In terms of pipeline, the Company currently has five MMORPGs under development, including one that is expected to be launched by the end of 2008, and another that is expected to be launched at the end of 2008 or early 2009. Based on the Company's current operations, total revenues for the third quarter of 2008 are expected to be between RMB368 million and RMB385 million. This represents an increase of 10% - 15% on a sequential basis and reflects the impact of domestic revenue growth, including new revenue from "Pocketpet Journey West," and an increase in overseas licensing revenue, which will include revenue from several expected commercial launches of the Company's games in various overseas markets.